Steins;Gate is an amazingly well-written time travel adventure. It is also one of the best visual novels ever made. New adventure Steins;Gate 0 lives up to the original in nearly every possible way. Originally published 3/10/16. Steins;Gate 0 is now out in North America for the PlayStation 4 and Vita, and it’s every bit as dark and twisting with English subtitles. The North American version also manages a little humor now and then. Note: Even writing about the setting of Steins;Gate 0 spoils the ending of the original Steins;Gate. For a non-spoiler look at Steins;Gate and Steins;Gate 0 (and the other games in the Science Adventure series), check out this article instead. Despite the “0” in the title, Steins;Gate 0 is not a prequel. Rather it is actually a midquel set in the middle of the original game’s true ending. After finally making it to the Beta worldline, Okabe is visited by this world’s Suzuha in her time machine. Although Okabe avoided the dystopia of the Alpha worldline and its parallel universes, Suzuha now wants his help in avoiding the Beta worldline’s similarly dark fate, World War III. To do this, all he must do is go back with her and do what he longs to do: save Kurisu from being murdered. And Okabe agrees to try despite the truth he learned over countless loops: If she is fated to die, she will. And in the worst possible twist, he inadvertently becomes fate’s tool and kills the love of his life with his own hands. Okabe, now thoroughly traumatized, refuses to try again—not wanting to see Kurisu die once more with no hope of saving her. 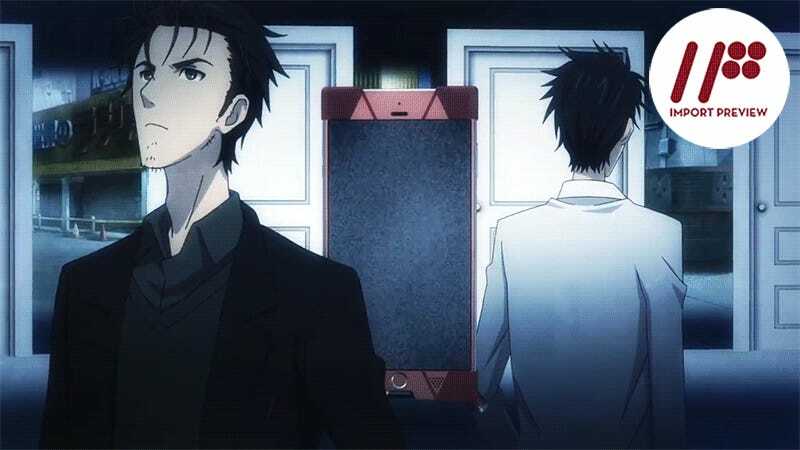 Yet, at that moment he receives a video message from his future self, explaining that Past Okabe had to fail once so that Future Okabe would be created—an Okabe that spent his life figuring out how to save Kurisu and finding the path to the perfect timeline: the Steins;Gate. Steins;Gate 0 is the life of that Okabe. It is the story of a broken man. After killing Kurisu with his own hands, Okabe attempts to move on with a normal life. He destroys the “Phonewave (name subject to change)” time machine and all related research, returns to college, and stops going to the lab altogether. The jovial, over-the-top “Hououin Kyouma” is gone and all that remains is a PTSD-riddled shell. It is in this state that he meets Maho, a Japanese-American neuroscientist and coworker/best friend of the deceased Kurisu. Upon learning of his friendship with Kurisu, Maho invites him to become a tester of their human memory back-up prototype “Amadeus”—an AI with the voice, personality, and memories of Kurisu herself. The story structure of the original Steins;Gate had one long proverbial trunk that ran from the beginning of the game to the true ending. The game’s other endings simply branched off this main trunk at various points to do their own thing. The structure of Steins;Gate 0 is different. There is no main trunk—rather it has two main branches that branch and then branch again to reach the game’s endings. It’s Okabe’s interactions with Amadeus that determine how the story of Steins;Gate 0 unfolds. Numerous times throughout the game, Amadeus will call Okabe. Answering or not answering these calls is what sends you down one branch or another. What’s interesting about this is that regardless of whether you chose to answer or not, both “choices” cause immediate shifts in the worldline. You are never able to see how the worldline you were on was supposed to play out. Why exactly these timeline shifts occur despite the absence of time travel technology is one of the game’s main mysteries. Of course, while Okabe’s story is the prominent one, Steins;Gate 0 is not his story alone. For Daru it is a love story where he is beginning a new relationship with the woman he knows he is going to marry (courtesy of future knowledge)—which adds a ton of extra stress into the budding romance. For Mayuri, it is a story of wanting to move from being the damsel in distress to the hero—or the story of her being a loving mother to an orphaned child no matter the timeline. Interestingly, Okabe isn’t even the only viewpoint character of the game. At times we also see the world through Maho’s eyes. While a genius in her own right, she struggles with her feelings of being the Salieri to Kurisu’s Mozart and ponders the mystery of how Okabe could have known her best friend even better than she did. The other viewpoint character is Suzuha—who is quite different from her Alpha counterpart. Because of Okabe, she has failed in her mission to save the future. So now she sits aimless during the last days of peace before a devastating world war, both hating Okabe and hoping he’ll change his mind and head to the past with her for one last try. But her failure is not the only guilt Suzuha suffers from. She has a secret that even Okabe doesn’t know: that she wasn’t alone on her trip to the past and now a young girl is lost in a time not her own. One of the best aspects of Steins;Gate 0 is the deceptive familiarity. While we have spent countless hours getting to know the various characters in the original Steins;Gate, that was almost entirely in the Alpha worldlines. Beta is a whole new beast where you can’t be sure if secrets learned in Alpha remain true. Are Moeka and Mr. Braun still Rounders in a world where SERN’s power is diminished? Are Okabe’s relationships with his friends as solid as before? Was Kurisu even the same type of person? There are two main paths (one on each side of the first major story split) vital to the resolution of Steins;Gate 0. One is loosely based on (though far from identical to) the Epigraph Trilogy of Steins;Gate novels. The other is completely new. Both of these stories are fantastic. Both are easily on par with the original game and grant deeper understanding of our heroes as they grow in one of the darkest collections of Steins;Gate timelines. And while an enjoyable self-contained set of narratives in their own right, they also do the necessary heavy lifting as we see how Okabe learns the tricks he needs to teach his past self to reach the Steins;Gate worldline. The four side endings are likewise enjoyable. The only one of these that is somewhat weak is Maho’s ending. It heavily diverges from the main plot and instead becomes the adventures of Maho, Faris, and Moeka. Still, even this works well as a character piece for the three girls and likely shows what Maho does off screen in the climax of several of the game’s other endings/aborted timelines. When it comes down to it, I wouldn’t say Steins;Gate 0 is better than Steins;Gate. I also wouldn’t say it’s worse than Steins;Gate. Steins;Gate 0 is Steins;Gate. It’s the second half of the same story. The difference is that the original game shows all the Alpha timelines it took to reach the final ending; Steins;Gate 0 shows all the Beta ones. To put it another way, if you’re a Steins;Gate fan, it’s the story you never knew you needed. Steins;Gate 0 was released in Japan on the PlayStation 4, PlayStation 3, and PlayStation Vita on December 10, 2015. There is currently no word on an international release.